Of course, type isn’t really a good predictor of romantic happiness and many couples (including INFP Isabel Myers and her ISTJ husband) are quite happy without matching on S/N. So maybe it’s not a good idea to just assume Sensors and Intuitive can’t understand each other. 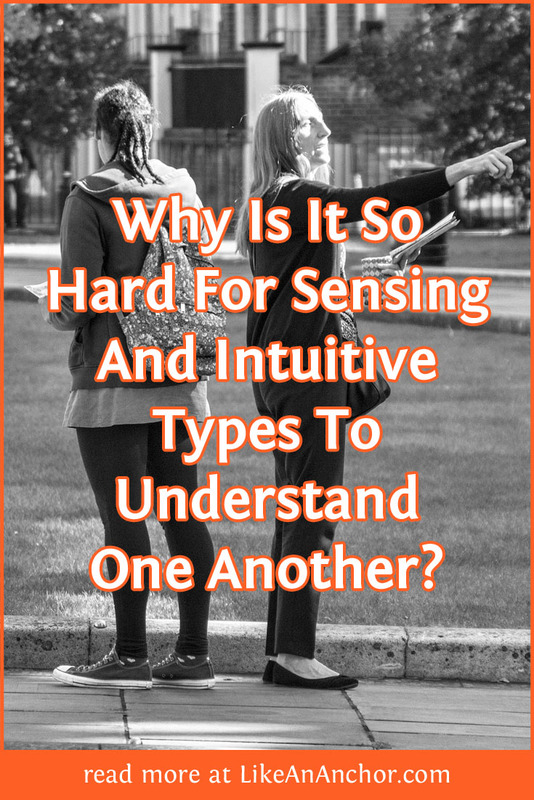 Perhaps what we really need is a better grasp of the real difference between Sensing and Intuition and a commitment to using that understanding to appreciate the strengths and differences of each type. Both Sensing and Intuition are Perceiving functions, which means they govern how we learn new information and experience life. They shape our worldview deeply and in ways we don’t always consciously notice. “Sensation functions in such a way that it may not prejudice facts; it shall not prejudice facts. To the sensation type, the ideal perception is that you have an accurate perception of things as they are without additions or corrections. On the other side, intuition does not look at things as they are. That is anathema to the intuition. It looks ever so shortly at things as they are, and makes off into the unconscious process at the end in which he will see something nobody else will see.” — Carl Jung, Jung on Elementary Psychology: A Discussion Between C.G. Jung and Richard I. Evans (page 140). Sensing and Intuition work very differently. Because they shape how we think and interact with the world in a fundamental way, it can be hard to see things from the perspective of someone using our less-preferred function. This is probably especially true of the dominant Intuitive (ENFP, ENTP, INFJ, INTJ) and dominant Sensing (ESFP, ESTP, ISFJ, ISTJ) types. 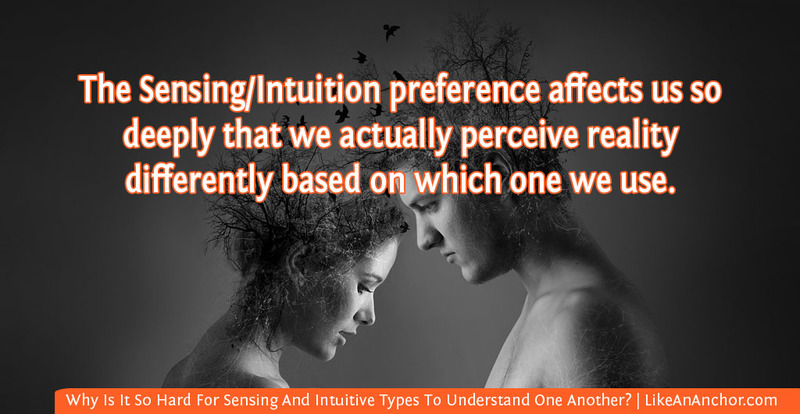 Their most comfortable, natural function is Intuition or Sensing and the opposite is their “blind spot.” The function that they don’t use comfortably can seem scary or exciting, but it’s not easy to understand in ourselves or in others. I recently started reading a book by Lenore Thomson, who writes about theology and psychoanalysis and has taught at the C.G. Jung Foundation in New York City. She has a wonderful explanation of Sensing and Intuition in her book Personality Type: An Owner’s Manual. Reading it, I felt like the proverbial light bulb went on in my head. It made all the other things I’ve been learning about Sensing and Intuition fall into place. It probably helped that she uses Star Trek to illustrate all her points, so she’s speaking my language. Thomson writes that even though “both Sensation and Intuition encourage us to live life in an immediate way — as it’s happening to us,” they can’t be used at the same time. They determine what “kind of experiences we regard as definitive” and they’re in conflict with each other. That helps explain why the S/N preference affects us so deeply — we actually perceive reality differently based on which one we use. For Intuitives, “the material surface of things” doesn’t matter nearly as much as the larger picture. They want to focus on meaning, future possibility, and underlying patterns because they’re fascinated with unknown, hidden, and unseen things. They tend to emphasis “originality and alternate meaning” (Thomson, Personality Type, p. 34-35). Think of Captain Kirk’s relentless pursuit of possibilities that others tell him are impossible to realize. Probably the most important thing to remember about the differences between Sensing and Intuition is that one isn’t better than the other. Sensing types aren’t boring and stupid, and Intuitive types aren’t air-headed, impractical idiots. Both approaches have strengths and weaknesses and we have no cause to belittle one or the other just because it’s unfamiliar to us or different than how we think. Another thing to keep in mind is that no one is a pure Sensor or a pure Intuitive. We each prefer one of those functions, but we all use both. Understanding how we relate to our tertiary or inferior functions can help us appreciate the types who use those functions comfortably. Myers-Briggs®types should be used as a tool for understanding self and others, not for belittling someone who doesn’t share your type. When we use this tool properly, there’s no “us vs. them” attitudes in the personality type community. Rather, there’s an appreciation for the wonderful gifts each type has for seeing the world in a way that’s unique to them. Your Turn: What are your experiences interacting with people who don’t share your preference for Sensing/Intuition? Want to get copies of the resources mentioned in this post? Click the links below. Please note that these are affiliate links, which means that, at no additional cost to you, I will receive a commission if you click on the link and make a purchase on that website. Great article. I understand Sensing as concrete thinking concerned with all that can can be taken in with the senses, and Intuition as abstract thinking pattern recognition. One day my estp friend and I (infj) had a discussion on who reads people faster and who is better at reading body language. This of course is an interesting discussion because I am a dominant intuitive and she is an dominant sensory. I noted that though she believes she has the monopoly on understanding body language which I am positive sensors do, I was quicker in interpreting the patterns and reacting to them and preducting the future outcome. I noticed we came to similar conclusion but using different cues. I like to do these things to continue to observe and understand the S/N dynamics better. In terms of Isabel Myers (INFP) and her ISTJ husband. While they used opposite perceiving functions, they are both in the same quadra, meaning they both use the same cognitive functions just rearranged differently. This may have counted for something. Not sure if you wrote about socionics and the personality quadras as yet. Yes me too. And boy do I adore ENFJs. After that I am hung up on NTJs. Nice article. My mom and dad are N and S types, but they still love each other like crazy.